So I am back on the travelling, with a flight in a few hours to Spain to go visit my factory and place some reorders for the webshop, as well as create new samples (as always!). BT (the ISP here in England) has been giving me some real problems this morning bouncing in and out of service (I hate them big time!!!) so I have lost a bit of time in writing a nice post to send you off for a few day (will try and sneak one in while in Spain…but it’s hard). Anyway, while I was last in Paris, I went to check out the Carmina shop and little did I know how extensive their women’s shoe range is. I was quite impressed with the array of models and color options. Time again I get asked about a nice make of women’s shoes that creates models based off of a man’s style. Well, here is the answer to all of your questions, ladies: Carmina…. 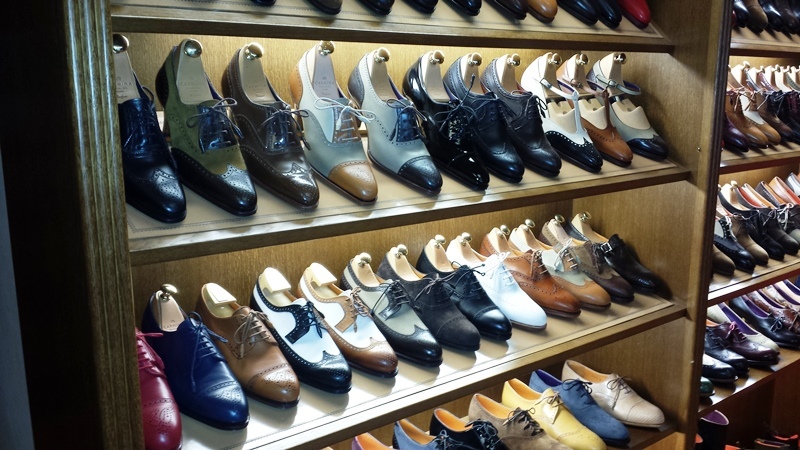 They make a great shoe, and seem to have a great collection, and like men’s I am sure that MTO is an option. Ultimately that means that sky’s the limit!! If you have yet to vote on the contest that I posted yesterday, please do so by clicking on the link in the right corner of the menu bar (above) and if you have yet to see the new collaboration that I am currently doing with Dandy Shoe Care (the patina artist), click on the advert box just to the top right!! I hope that everyone enjoys the rest of the week and I will try and be as active as I can while away in Sunny ‘ol Spain! Gorgeous shoes, thanks for the recommendation!